1. For the sponge: preheat the oven to 180C/160C fan/gas 4 and line a cupcake/muffin tin with cupcake cases. Cream together the butter and both sugars until it is light and fluffy. You can use an electric hand whisk to do this. 2. Add all the vanilla and then the eggs one at a time, whisking well after each addition. If the mixture begins to look like it has curdled add a couple of table spoons of the flour and beat well until the mixture looks smooth. 3. Using a metal spoon fold in the flour, baking powder and salt (add them altogether) and then stir in the maltesers. 4. Divide the mixture equally between the 12 cupcake cases and bake in the oven for about 25 minutes or until a skewer (or toothpick) inserted in to the middle of a cupcake comes out clean. Onced cooked remove from the oven and leave to cool in the tin. 5. For the buttercream: using and electric hand whisk, whisk together the butter, icing sugar and vanilla until it becomes pale and fluffy. 6. To decorate: once the cupcakes are ready, you can either dollop the buttercream on top of each cupcake and spread it around with a knife. 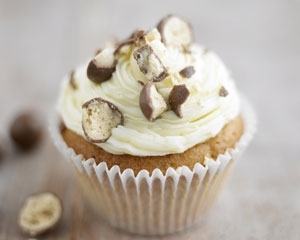 Or for a more professional look fit a piping bag with a 1cm star nozzle and pipe the buttercream on top of the cupcakes. Sprinkle on some crushed maltesers to finish. This entry was posted on at and is filed under All Chocolate Cupcakes. You can follow any responses to this entry through the RSS 2.0 feed. Responses are currently closed, but you can trackback from your own site.